With the US Supreme Court’s October 6, 2014 decision not to challenge lower courts’ legitimization of gay marriage, it is easy to forget that the gay marriage tidal wave was started by a cultural earthquake many years in the making. That is to say, cultural forces, institutions, and conversations---most of them nurtured by those almost completely outside the orbit of orthodox Christianity--- laid the groundwork for a vast social experiment deeply at odds with historic Christian thought. What follows is the report of an event at the University of Minnesota in October 2012 that occurred just before the tidal wave began its tumultuous sweep across the American social landscape. The story’s cultural lessons are as painful (with respect to the institution of marriage) as they are instructive (for the task of evangelism). 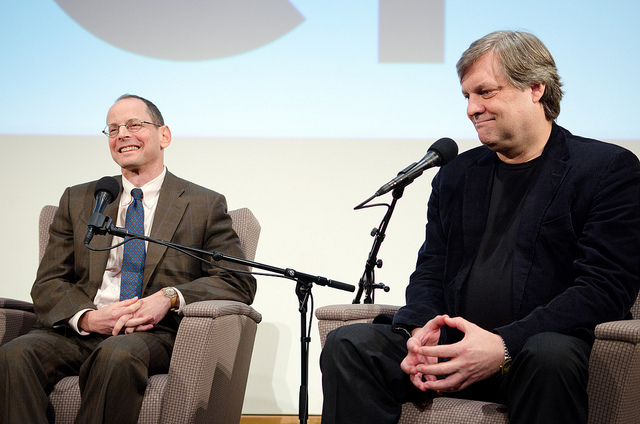 In October 2012, on the University of Minnesota’s West Bank, before a live audience of several hundred (and an online and radio audience of thousands), David Blankenhorn announced that he had become an advocate of gay marriage because of his friendship with Jonathan Rauch. Until then, Blankenhorn was known as America’s most articulate secular conservative opponent of gay marriage, having written in 2009 an apologetic for traditional one man-one woman marriage titled The Future of Marriage. Rauch, a noted journalist and writer, had openly declared his homosexuality many years earlier. As Blankenhorn told the audience that autumn afternoon, he had always pursued virtue. A young man on the white side of Mississippi’s color line, he had advocated civil rights for African-Americans in his home state and beyond. His later advocacy for the institution of marriage grew out of concerns for growing fatherlessness. He admitted, however, to one sin: In a gay marriage debate eight years earlier, he had an angry exchange with Rauch. Blankenhorn the penitent had felt the need to apologize to Rauch. For his part, Rauch offered a compelling narrative of earnest longing to be heterosexual while growing up with deep, unshakeable homosexual desires. Now, 30 years later, Rauch had a message for the very earnest and solemn audience that I had joined at the University of Minnesota’s Humphrey School: Heterosexuals broke the institution of marriage, but gays and lesbians can help rescue it if only we heterosexuals will let them into the club. Blankenhorn’s apology had ignited a deep friendship with Rauch, but one marked by deep differences over gay marriage. So genuine was the respect between these two that Blankenhorn invited Rauch (his erstwhile opponent) to write the preface for Blankenhorn’s 2009 book. Kindness. As in the biblical story, Jonathan had showed kindness to his dearest friend, David. Blankenhorn now travels the country promoting the dual gospels of civility, on the one hand, and, on the other, gay marriage as salvation for the larger institution of marriage. For both the Christian evangelist and the Christian policymaker, we see confirmed in nature what we also know from Scripture: Relationships matter deeply. The Apostle Peter wrote in I Peter 3:15-16: Always be prepared to give an answer to everyone who asks you to give the reason for the hope that you have. But do this with gentleness and respect, keeping a clear conscience, so that those who speak maliciously against your good behavior in Christ may be ashamed of their slander. Does this mean that Christians risk capitulating our biblical views by engaging our opponents in sincere relationships? Blankenhorn says he was raised in a Presbyterian church, but were his convictions deeply rooted in Scripture? Shallow roots rarely meet tidal waves that don’t uproot. I suggest that we have no reason to stop relishing the friendships and kindnesses of our opponents, even as we have no reason not to persevere in hopes that they will bend their knees to join us on the humble, sweaty, well-trampled ground at the foot of the Cross. Doing so requires a humble epistemology of critical realism that acknowledges the possibility that we (not God) might be wrong. It also means enduring abuse for our insistence on loving the sinner while hating the sin. And, yes, it always means a willingness to walk empathetically in other’s shoes. Perhaps if we are willing to walk this path farther we will see others converted to the truth of God in Christ, whether as evangelists or policymakers. We will relish their liberation as much as we relish our friendships with them. Christians in the West have to admit that playing defense is inherently hard. Tactically, offense is always easier, and Jonathan Rauch had that one on David Blankenhorn. If Rauch's fears come true, namely, that gay marriage fails to rescue the institution of marriage, then offense will suit us nicely. But only if we are willing to always, relentlessly, perseverantly love those who consider us enemies, deluded, or ignorant. Civility thrives, and Christ is the final victor.